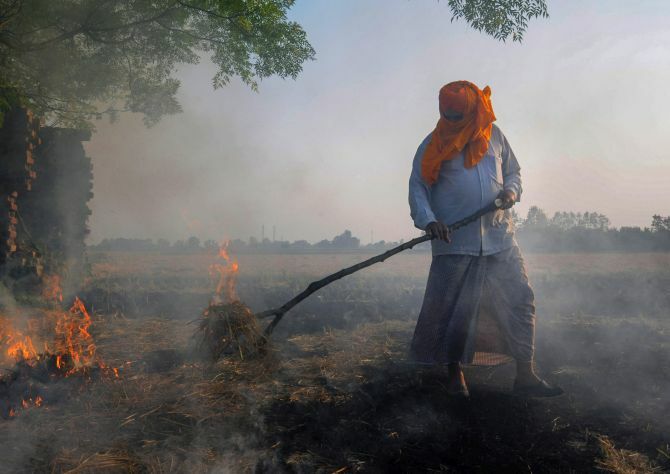 With paddy growers being blamed for causing air pollution, farm experts and farmers' outfits said they are compelled to burn stubble as they do not have any other feasible and cheap option. 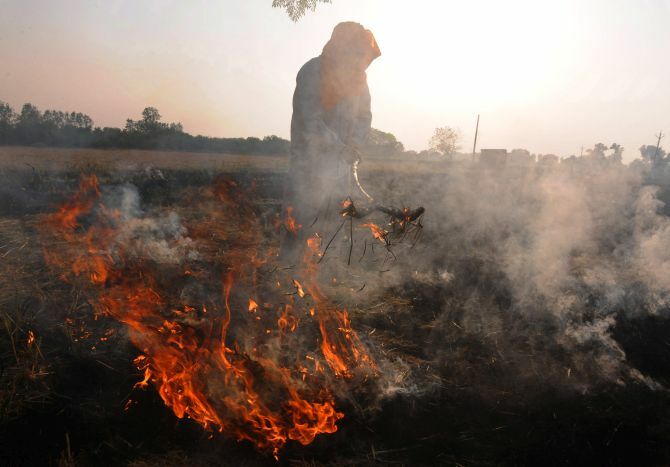 Scores of paddy growers in Punjab and Haryana continue to defy the ban on stubble burning, claiming they are "compelled" to do so in the absence of any financial support from the government for farm waste management. Governments of the two states are pinning hopes on farm mechanisation for the effective management of crop residue but the use of farm equipments, growers say, is not the "best solution which will take care of just minuscule area" of paddy. With paddy growers being blamed for causing air pollution, farm experts and farmers' outfits said the community is a "soft target" and the "short-sighted" approach of policy makers in the government has not only "failed" to address the concerns of the growers but also to achieve the task of zero stubble burning. "Farmers do not want to burn paddy residue. But they are compelled to burn stubble as they do not have any other feasible and cheap option," said Bhartiya Kisan Union (Rajewal) president Balbir Singh Rajewal. "Farmers who are in debt trap are committing suicide and now the government is taking penal action (imposing fine) against growers who burn paddy residue. 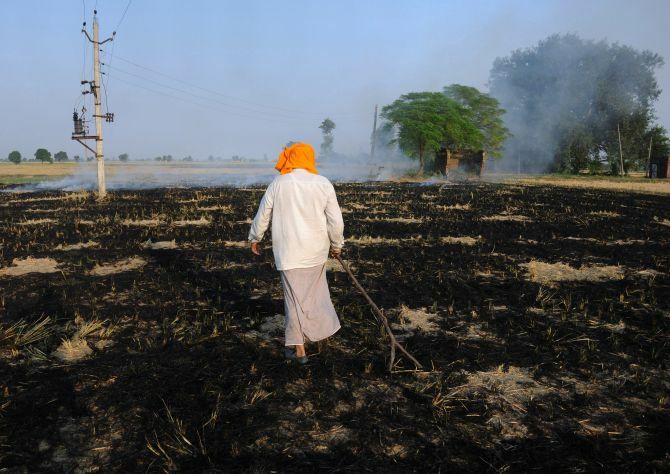 Farmers have become soft targets for the authorities despite the fact that just 8 per cent of air pollution caused by farm residue burning," Rajewal said. Every year, Punjab and Haryana are blamed for rising air pollution and smog caused by crop residue burning by growers. "Any delay in next wheat crop will lead to drop in yield and it will cause financial losses to farmers," said Rajewal. "Giving Rs 200 per quintal to growers is the only option available to the government for the management of crop residue. What is the harm in giving money to growers when a substantial sum of money is spent on crop procurement," asked noted farm expert Devinder Sharma. "If a farmer burns residue even after receiving money for its management then you take action against him/her," he said. Farm experts described distributing farm equipments such as Happy Seeder, paddy straw chopper' cutter, mulcher etc., to growers will add more to their cost. "We have calculated that the use of machines is putting an additional cost burden of Rs 5,000 to Rs 6,000 per acre on the farmers, which they are unable to afford," Sharma pointed out, adding that machinery would deal with just four per cent of total paddy area. The farmers' union also accused the government of not complying with the National Green Tribunal order which had directed it to supply machinery free of cost to farmers owning less than two acres of land. "For those who have land more than two acres but less than five acres, the machinery should cost only Rs 5,000 and those who have land more than five acres, the farm mechanisation cost should be Rs 15,000," said Rajewal. "Earlier rotavator was available at Rs 85,000 now it costs Rs 1.30 lakh. Similarly, cost of other machinery has also been increased," Rajewal said.